This workshop has already taken place. You can learn more about what happened at the workshop by perusing the presentations and resources listed on the Workshop Program. 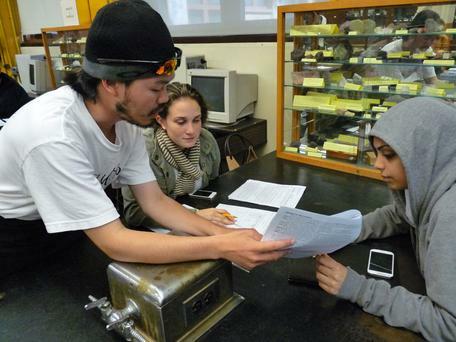 Student mentor in Geography class at San Francisco City College. Courtesy Katryn Weise. Improving student success is an important priority at most U.S. two-year colleges (2YCs), whether as an institutional goal, for accreditation, or as part of the Achieving the Dream initiative. Work on this priority is especially challenging because of the variety of students who enroll at a 2YC. By working together, 2YC geoscience educators can address the challenges and share their successes in teaching students with a wide range of abilities, preparation, and goals. At this workshop, participants will learn how recent research on topics such as student learning, social psychology, metacognition, and differentiated instruction can help support student success in geoscience at 2YCs. Since no 2YCs are alike, participants will assemble a menu of best practices and strategies for supporting student success. Contributions from participants and summaries of workshop discussions and recommendations will be important additions to the SAGE 2YC website. Workshop participants will also prepare individual or collective action plans for future work and leave with new ideas for their courses and institutions. They will become part of a network of colleagues who share similar challenges and concerns for the success of 2YC geoscience students. This workshop is open to 30 participants by application. There is no charge to attend and our grant will support faculty travel expenses as well as meals and lodging at the workshop. A workshop overview contains information about the workshop goals, expectations for participants, and the application process. This work is supported by the National Science Foundation Division of Undergraduate Education through grants DUE 1122592, 1122640, 1122660, 1122737.